Love is in the air and we want to help you make this Valentine’s Day the best ever. Las Vegas in February is a great time to visit with numerous concerts coming to town this month. Catch all the excitement at a Vegas Golden Knights hockey game at T-Mobile® Arena, indulge in winter spa specials, explore Eataly the largest Italian marketplace in the world at Park MGM or pick a romantic spot to dine on The Strip for a nice evening out. 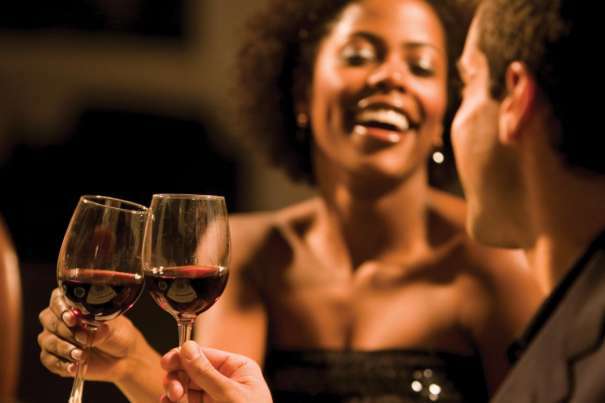 There are many options where you can enjoy a romantic dinner on The Strip. Many of the MGM Resorts’ restaurants feature decadent menus and specials on Valentine’s Day. 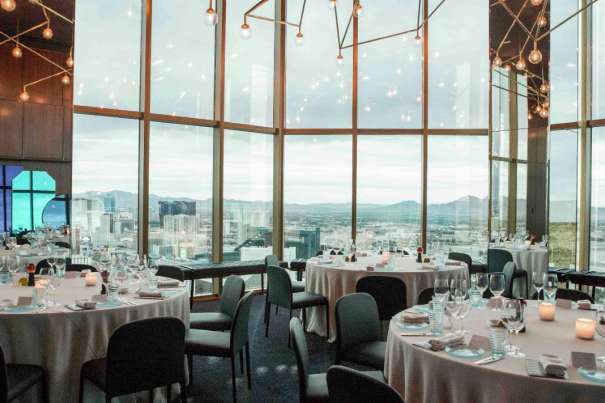 If looking for cuisine as memorable as the view, book a table at Rivea at the Delano Las Vegas, where you can enjoy French and Italian coastal cuisine with the sight of The Strip. Nearby, at Mandalay Bay, Aureole and Fleur by Hubert Keller has amazing seafood featured menus that includes favorites such as a Maine Lobster Salad, Seared Maine Diver Scallops, Dungeness Crab Risotto and more! At the ARIA, check out the exquisite food offerings offered on Valentine’s Day. Over at Vdara, enjoy milk and dark chocolate fondue at VICE VERSA and at the Market Café on the February 14 through the 17th. For more helpful suggestions on romantic restaurants, check out our list for the Top Five Romantic Restaurants to Dine on The Strip. If looking for somewhere different to dine, check out Eataly at Park MGM, the largest Italian marketplace with restaurants in the world. Maverick Helicopters are the ultimate romantic gesture for Valentine's Day. We recommend the Vegas Nights flight where you and that special someone will soar high above the world-famous Las Vegas Strip as you witness iconic landmarks such as Bellagio, MGM Grand, Luxor, T-Mobile Arena, ARIA, historic downtown and more. 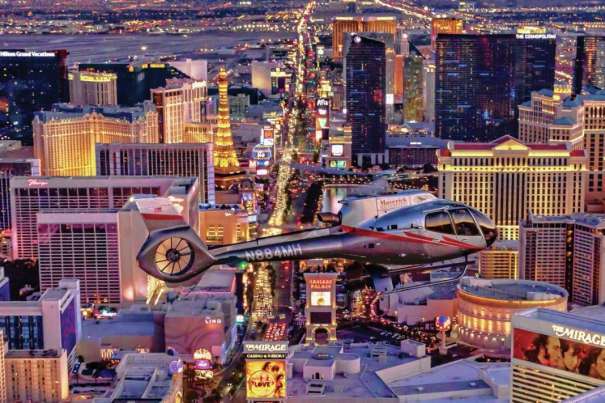 This 12-15-minute flight takes you high above the east and west ends of The Strip, so you can enjoy the best view possible. Champagne is available to all guests 21 years of age or older prior to the flight! ARIA is having Valentine’s Day spa specials the entire month of February. We recommend the Himalayan Salt Stone Couples Massage that features warm stones that create a deeper sense of relaxation. This experience for two, will ease muscle tension and allow your stress to melt away while relaxing in a soothing environment. Book any Romantic Treatment at the Spa at Mandalay Bay and receive a box of chocolate truffles. Try the Heart and Sole Couples Pedicure, where you can sit back, relax and indulge in this side by side pedicure with your loved one. Your pedicures will include all elements of a classic pedicure as well as a rose petal soak and hydrating paraffin treatment and gentle massage leaving you pampered from heart to sole. The Nurture Spa at the Luxor Hotel also has amazing Valentine’s Day specials for couples massages, champagne pedicures, as well as specials on salon treatments! 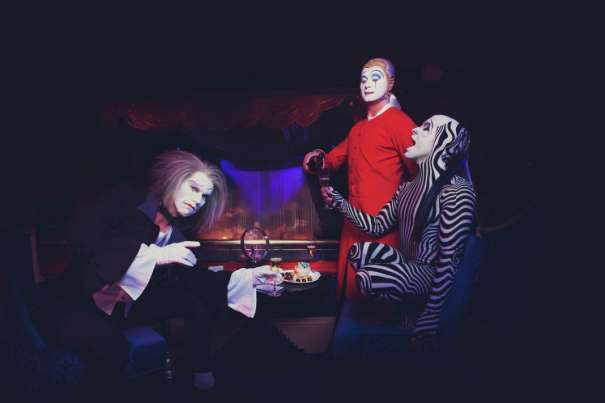 After dinner, attending a Cirque du Soleil show is a must, however, take it to the next level and purchase a Cirque du Soleil VIP Package. These packages offer an exclusive performer meet and greet, beverage inclusions, VIP seating and more. If looking for some great comedy venues around Valentine’s Day check out both the Aces of Comedy at The Mirage and the Brad Garrett’s Comedy Club at MGM Grand. A for sure great date idea is Topgolf, the 4 level interactive entertainment venue with interactive golf balls that score themselves. While there, enjoy hundreds of HDTVs, a personal server, and an amazing view of The Strip. Schedule an unique date and book tickets to a Vegas Golden Knights hockey game where the electrifying atmosphere can only be described once you experience it yourself.